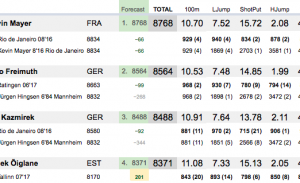 On this page you can find all the Ten7events forecast reports for men’s Decathlon, 2017 World Championships in London. In addition to the current standings you get a forecast of how the remaining events might proceed. In most cases the athletes’ results are compared against their PB or some other recent best performance. In addition to competition standings you can see results, points and rankings after each event. 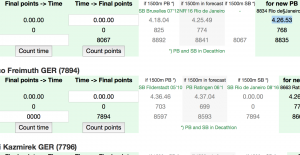 The report also has a section for comparing the forecast to athlete’s PB and his/her nations NR. This report has the same contents as ‘Standings sorted by Forecast’ but the results are sorted by the standings. 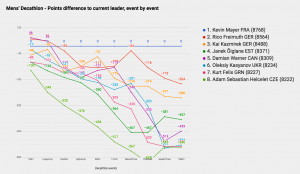 The points behind graph visualizes how many points top-8 athletes are behind (or ahead of) the current leader after each event. 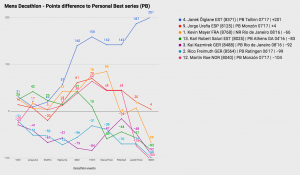 This graph shows the best performers when comparing the athletes latest standings to his/her PB. 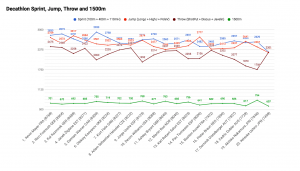 See how fast athletes need to run 1500m to beat the competitors ahead of them in the overall points. The differences are shown not only in points, but also in seconds and meters. The report will be updated after the 2nd last event, Javelin Throw. 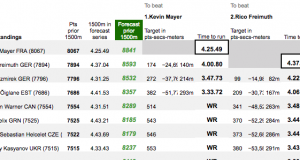 Interactive chance to speculate with the final results before the last event, 1500m. Your chance to speculate with the athletes’ event results and points. 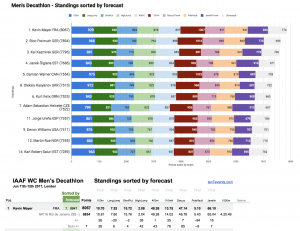 The current standings and forecasts are used as the default results, but you can change them according to your own forecast. 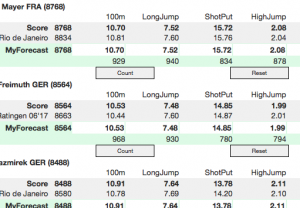 Athletes ranked based on summarized points from the three main event categories: sprint, jumps and throws. 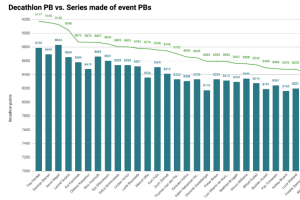 What if we collect the participants PBs into one series? Who has the most potential?